At the Shadwell Basin Outdoor Activity Centre you can try all kinds of water sports. Here are a few of the activities: sailing, canoeing, kayaking, sub aqua, dragon boating, bell boating (these use very safe boats) and power-boating. You could also try climbing or camping. The staff are qualified to show you how to use all the water sports. The Centre has a clubroom and changing rooms with showers. They have wetsuits, wet weather clothes and buoyancy aids for you to use. You should wear sensible shoes. Wellingtons are best if you are sailing or power-boating. Trainers are best for canoeing. Bring clothes to change into when you finish. There are lockers to keep your things safe. To use the lockers you need a 20p coin. You can bring your own lunches and eat them outside by the Thames. Book your tickets by phone 2 - 4 weeks before you go. Call 0207 481 4210 and ask Mike or Janice about buying tickets. It is a good idea to phone the Centre to find out about prices. This is because there are lots of different things to do and you can have different kinds of support. You can buy cold drinks at the Centre. A coke costs around 50p. 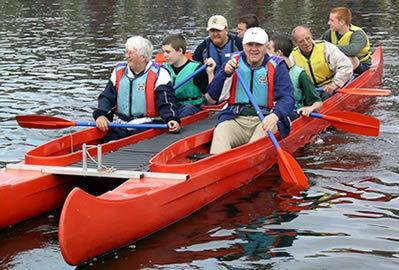 Shadwell Basin Outdoor Activity Centre is in Shadwell Basin near the Prospect of Whitby Pub. You need to call and book parking spaces before you go. You should do the same for accessible parking. Cars and buses can stop at the Centre to drop you off - then they can park at the parking space. The D3 is the nearest mobility bus during the day. East London Line - Shadwell underground station is about 700 metres from the Centre. This underground station is not accessible for wheelchair users. Limehouse mainline station is about 1100 metres from the Centre. You enter the club and changing rooms through wide double doors. There are ramps in the Centre so you can get around easily. There is plenty of room for a wheelchair user to move around inside. There is a lift to the classrooms upstairs. The minimum door width is 790mm. There are toilets on the ground floor in the male and female changing rooms. The minimum door width to the toilets and changing rooms is around 780mm wide. There is an accessible toilet upstairs in a unisex area, the minimum door width is 865mm.